When you’re putting one hundred and ten percent of yourself into your work, it’s nice to be rewarded by your company with a corporate retreat to a stunning location like Lake Tahoe. Here in the mountain air by the shore of one of the world’s biggest and deepest alpine lakes, employees can collect themselves, re-center their goals, think with a clear head, and most importantly, have a great time bonding together. The first step to planning a successful Lake Tahoe corporate retreat? Finding the right place to stay! Take a look at our exclusive selection of rentals for luxury retreats in Lake Tahoe below! Sweeping, panoramic views of the Tahoe landscape set the mood for your Lake Tahoe retreat, a combination of fresh air and renewed optimism. Look out at these views from the open-air deck, which has outdoor lounging furniture and a barbeque grill. Many of our properties also boast private or community amenities, including hot tubs, pools, saunas, recreational centers, gyms, and golf courses within steps of your door. Living rooms with high-end leather furnishings provide another place for downtime relaxation, where guests can watch a show or movie on the flat screen television while curling up next to the fire. Alternatively, you can soak up the views from inside these luxury retreats in Lake Tahoe, staring out through wide windows that allow natural light to diffuse into the open, airy floor plan, brightening spaces and faces. 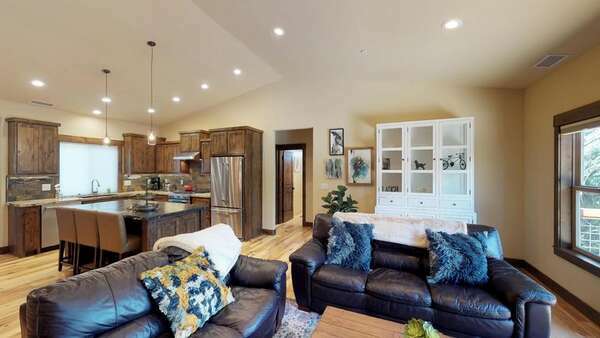 Whether you choose to rent out a number of different cabins or house everyone together in one or two homes, our corporate rentals in Tahoe have ample space and privacy so that everyone enjoys their stay. For dining in between catered events and going out to restaurants, utilize the vast kitchens in these luxury retreats in Lake Tahoe, equipped with top-of-the-line appliances and sizeable countertops. Even if all you use the space for is reheating your catered meals or leftovers from delicious nearby Truckee restaurants, the kitchens in our homes will prove useful. Dine outside on the deck for a mountainside al fresco meal with gorgeous views, or indoors at the dining table and bar seating. As the day winds down, pamper yourself with a soak in the tub or a hot shower, then climb into your plush bed for a restful night’s sleep before the next day’s adventures begin. Nothing builds a bond within a team of coworkers like having them share an exciting sport or activity where there’s an element of risk but also a whole lot of fun, and one of those sports is hang gliding. Taking your team to the same places over and over will not have the same effect on their moral as having them take to the air. It’s a whole different view that meets their eyes once they go up in the sky. The powered hang glider comes with an instructor and hovers over Lake Tahoe. Two people can fly together on the same hang glider which gives them an experience unlike any other. These flights can also count as training for anyone looking to get a pilot license. The sessions are all day and can last from one to three hours. Rafting on the Truckee River is one of the most intimate experiences you can have with this old waterway during your Lake Tahoe retreat. It’s a great activity that is suitable for all ages and doesn’t have restrictions on fitness levels or skills. Even if you have never touched a paddle before, you can pick up rafting fairly quickly. The fun starts once you reach the Truckee River Gorge. Here the rapids will give you the thrill of your life. Hang tight and try not to fall into the water. The thrill of the sport will bring the team together, as they have to work as one to get past the hurdles in the river. Other tours explore both the Carson River and the American River; both of them fork out of the Truckee River. Each trip lasts for two hours of fun. All safety equipment like helmets and vests are supplied by the tour provider. While taking a joy ride on the Truckee River can be fun and helps build up the team spirit, sometimes letting the group explore their creative and artistic side can have the same effect. For that purpose, visiting candle and pottery shops that offer classes to make candles, create mosaics, and paint pottery is a wonderful activity that is also both fun and entertaining. Some of the classes are about making stuffed animals, and you can get all the needed materials from the shops. If you prefer to have a theme party, the shop is the perfect setting for such parties or special events. Contact our reservation specialists today to find out more about what’s waiting for you on your Lake Tahoe retreat when you book your stay in one of our spectacular vacation rental properties!